The hallmark of any “what should our party do next” debate is, as Ross Douthat notes, that all participants insist the answer is to do more of whatever they always wanted the party to be doing. Jonah Goldberg offers up a rare and intellectually honest exception, conceding that, though he may despise “compassionate conservatism” as a governing philosophy, it’s actually a much better way to win elections than openly advocating for the kinds of small-government policies Goldberg prefers. Romney didn’t just fail to articulate a plausible economic program that would rekindle growth in America; he failed to really hammer home just how bad Obama’s handling of the economy has been - and how the president’s mindless interventions actually exacerbated the problems they were supposed to address. Yes, that’s it — if only Romney had thought to “really hammer home” that the economy was bad and Barack Obama’s big-gummint policies were the cause. Did Romney even mention that the economy was bad? Where did he stand on the whole taxes and spending versus freedom debate? I can’t even remember. It’s certainly true that libertarianism is a broad and varied enough ideology that there are some ways in which more of it may have helped Romney win. (Say, supporting more humane immigration policies.) But it seems obvious that, as even Goldberg concedes against ideological interest, Romney’s economic libertarianism was a millstone around his neck. His 47 percent comments reflected the Ayn Randian sentiment that has swept through the GOP, a phenomenon Gillespie has celebrated. Calling most Americans worthless parasites who owe everything they have to the genius of the handful of entrepreneurial geniuses is a fine worldview for building a cult, but an awful one for building a political majority. The whole Randian philosophy is built around a terror of the masses. Her vision may or may not be incompatible with democracy, but it’s not well suited to win elections. 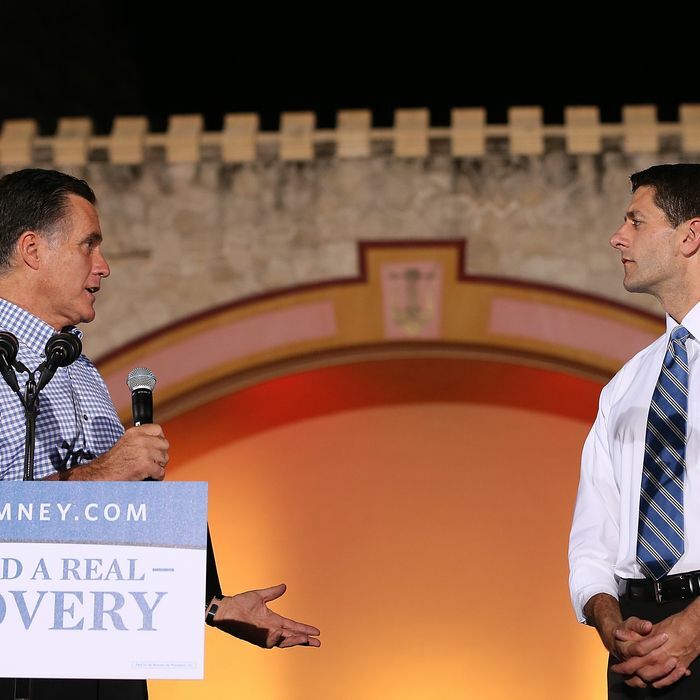 At a more practical level, Romney’s anti-government dogma left him unable to propose any concrete solutions for things most people regard as problems. It’s fine to believe that market outcomes are inherently just, and redistributing resources from rich to poor is inherently wrong. Over the last 30 years, though, a vastly disproportionate share of economic growth has accrued to the richest one or two percent of the population. And so a political ideology dead set against redistribution is going to have to force the vast majority of the electorate to accept meager rises in living standards while the most fortunate enjoy spectacular increases. It’s not an easy sales pitch.